Improving persistently low student achievement levels is one of the greatest challenges facing Kansans. Some students do quite well and overall outcomes are a little better than the national average, but there’s still tremendous need for improvement. The National Assessment of Educational Progress (NAEP) shows only about a quarter of low income students are Proficient in Reading and Math, and just about half of the rest are Proficient. Compared to the other 49 states, rankings for low income students ranges from the mid-teens (#15) to the mid-twenties (#26); rankings for students who aren’t low income range from #16 to #30. ACT scores show similar results, although ACT reports results by racial categories instead of income levels. White students’ score is ranked #24 in the nation and 35 percent of those taking the test were considered college-ready in English, Reading, Math and Science. Hispanic students are ranked #19 with 14 percent considered college-ready, and African American students are ranked #25 with just 6 percent college-ready. The Kansas Association of School Boards says Kansas has the 10th best outcomes in the nation, but unfortunately Kansas doesn’t have a single Top Ten ranking in any measure of proficiency or college-readiness. Whoever is elected governor and to the Kansas House of Representatives this fall will have look for ways to improve student achievement, and citizens deserve to know the issue exists and how legislators intend to resolve it. Kansas Policy Institute does not support or oppose candidates for public office, but we do provide educational information to the public about key economic and education issues facing Kansans. Our 2018 Voter Issue Guide is intended to arm readers with facts and key questions to consider so each reader can be better informed on the issues. This article provides a deeper examination of the student achievement challenge, which is the second of five issues covered in the 2018 Voter Issue Guide. Contrary to claims by education officials, simply spending more money has not produced better achievement in Kansas or anywhere else. Reading proficiency levels on the National Assessment of Educational Progress (NAEP) went from just 35 percent to 37 percent over the last 19 years, while spending increased far more than inflation. Kansas students’ average score on the ACT test is exactly where it was 20 years ago, and only 29 percent of all students taking the test last year were considered college-ready in English, Reading, Math, and Science. Cross-state comparisons of spending and achievement also demonstrate there’s no relationship between spending and achievement. 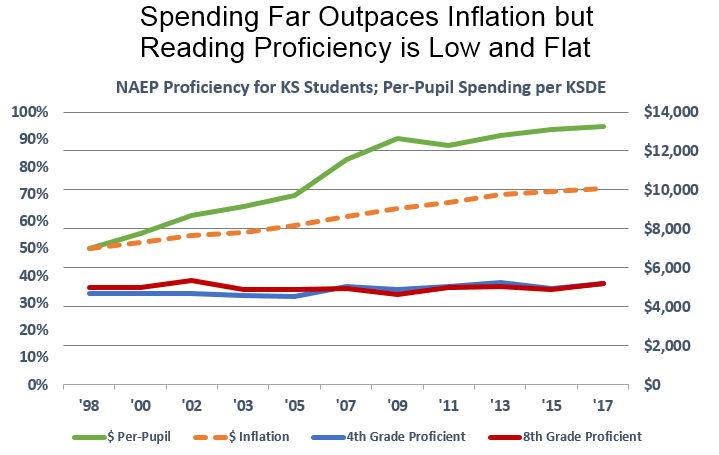 Between 1998 and 2015, Kansas had a 39 percent real (inflation-adjusted) per-student spending increase the reading score for 4th grade low income kids only improved by two points. At the same time, the national average for spending grew much slower (24 percent) but Reading scores improved by 14 points. New York got the same 14-point improvement but had a whopping 45 percent spending jump. Florida, on the other hand, had a tiny spending gain of just 4 percent, but their Reading score shot up 30 points! Florida also has much stronger gains for other students and subjects, even while spending much less per-state each year; in 2015 for example, Florida spent just $10,168 per-pupil while Kansas spent $12,753. The difference is that Florida has had a long-term focus on holding schools accountable. They have a robust public charter school system as well as other choice options for parents. Their pioneering 3rd grade reading initiative – not promoting students to the 4th grade unless they could read at grade-level – has been adopted by many states, but not Kansas; legislators caved to pressure from unions and local school boards. Florida also introduced strong transparency measures, including an “A-F grading system” so parents know how their school is performing. The Kansas Department of Education (KSDE) says funding set another new record last year at $13,620 per-pupil, which is 45 percent higher than if funding had simply been increased for inflation since 1992. KSDE also estimates that complying with court rulings will push funding to $16,520 per-pupil in five years, even with no increase in federal aid and minimal gain in local funding; that’s more than $6,000 per-pupil (and 60 percent) above long-term inflation. Given these facts, here are a few questions about student achievement to consider. –Do you believe massive funding increases alone will cause achievement to improve? –Should there be some student-focused consequence to schools that don’t improve achievement? For example, should low income kids in schools with average scores below grade-level be allowed to take their funding to another school of their choice? –Should Kansas adopt any of the Florida innovations?